Popular opinion says that when Montreal Canadiens fans at the Bell centre harassed two Ottawa Senators fans during Friday night’s game, it was wrong. Social media saw comments on how this is typical behaviour for Montreal fans or how Montreal fans were embarrassed on behalf of the Canadiens and their fandom. Less popular topic of discussion: the fact that the targets of this violence were young women and their assailants a group of men. Sens fan Katie Kerrick was assaulted at Friday’s game. 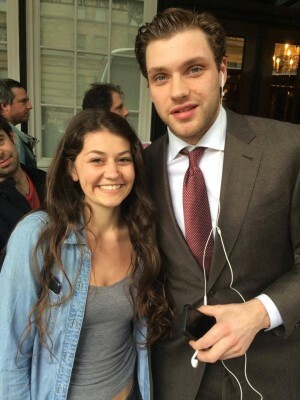 Prior to this she met Ottawa player Bobby Ryan. Photo from Kerrick’s Facebook page. Sports culture—jock culture—is part of our national masculinity. And in the case of Canada, national manliness is all about white middle class men playing hockey, chugging beer, and getting maple leaf tattoos, as pointed out by William Bridle and Martyn Clark in “If Canada is a ‘Team’, Do We All Get Playing Time? Considering Sport, Sporting Masculinity, and Canadian National Identity.” Our Canadian heroes are players like Sidney Crosby: white, assumed to be heterosexual, and rich. Hockey players are known for their hard work and making it to the top. Undoubtedly a lot of work is put into becoming and remaining a NHL player. But, it’s not exactly like the majority of hockey players started from the bottom and hard work alone got them where they are today. In the last 10–15 years, minor league hockey costs have dramatically increased, “It’s a development that threatens the sport’s blue-collar roots, including the idea that the next Gordie Howe or Wayne Gretzky will come from backgrounds as modest as theirs were,” James Mirtle reports in a 2013 article for the Globe and Mail. “Players of modest means in this generation must beat out peers who are often better trained and have spent many more hours on the ice, thanks to wealthy parents.” Wealthy, in the majority, is connected to whiteness and men. The NHL insists “Hockey is for everyone,” boasting its history of black players. Still, there’s no question the majority of players are white—white Europeans, actually (but somehow this is a Canadian sport). At the professional men’s level, hockey is an aggressive (thus manly) sport, and it can easily become a place where both players and fans release their aggression. In the case of fans, frustration from socio-economic stress, bruised egos and socially-taught entitlement, can all add fuel to the fire. Michael Kimmel writes about how the growing divide between the haves and have-nots has added to white male anger in his book Angry White Men: “It requires that we both look into the hearts of regular guys, as well as those who feel marginalized, and that we examine the social and historical circumstances that brought them to this precipice.” I wonder whether this sort of this behaviour will be seen in the stands of National Women’s Hockey League games? Or is automatically part of a less “manly” culture—the kind that won’t attract the type of men who attack two young women? When Kerrick and her sister were hit with towels, shoved, called “whores”, and had beer poured on them, it wasn’t because Montreal fans are inherently evil. It has nothing to do with the city or the specific team. It isn’t even a result of the sport itself. It is a result of the culture we created and continue to perpetuate. This culture allows this group of men to think their entitlement and assertion of manliness is acceptable behaviour. And when attendants dismissed the women’s abuse and did nothing, when security was nowhere to be seen, these men were proven right. Our anger at the city of Montreal would serve everyone better directed at the mentality that “boys will be boys” and this is how Canadian boys are expected to act.